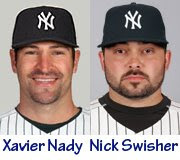 lenNY's Yankees - A Bronx Bombers Blog: Nady or Nick? You're not going to get a proven starter from the Mets for either of those guys. "Proven starter" maybe getting my hopes up, but Nick Cafardo's exact words were that "he could land them an end-of-the-rotation starter." I think that Nady has enough value to get someone like a Darren Oliver from the Angels, or maybe a Jonathan Sanchez/Matt Cain of the Giants. Maybe they'll reunite with Tim Redding. We shall see. Darren Oliver is no starter. Maybe so, but I don't really see Nady ending up with the Angels because they already have Vladi, Hunter, just resigned Juan Rivera, Gary Matthews Jr. and Reggie Willits. I say if you're going to trade Nady, trade him for some Double-A hitters who could eventually make it to the parent team. The Yankees' minor league system badly needs hitters with high-impact potential.